Lagniappe II (pronounced Lan yap) is a Gulf-front home located approximately 2.7 miles west of Hwy. 59 on West Beach Blvd. in Gulf Shores. It has a total of 5 bedrooms and sleeps 12-16 (maximum of 12 adults). Lagniappe means "a little something extra". To us, the extra is a wonderful big living room that actually has space for everyone in a big family to sit and relax together, an open kitchen for gathering, and beachfront porches that span both levels. The main level of Lagniappe II features a Gulf-front living area that spans the width of the home, a dining area, and a large fully equipped galley kitchen with a tiled bar for additional seating. There is also a laundry facility and half bath located on the main level. The bedroom on this level is located on the northwest side of the home and has a king bed with a private full bath. The second level of Lagniappe II features a common sitting area with access to the outside deck; there are four bedrooms as well as two full baths. Both Gulf-front bedrooms each have a king bed, one north bedroom has two queen beds, one has two double beds. 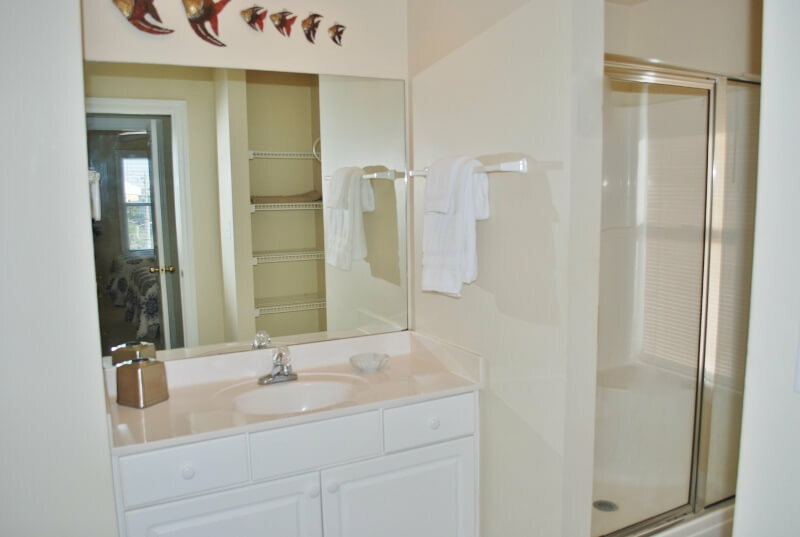 The northwest and southwest bedrooms share a common bath and the northeast and southeast bedrooms share a common bath. The upstairs hallway has an alcove with a twin daybed and twin trundle. Located in West Beach, about 2.7 miles from Hwy 59 and close to Lagoon Pass. Love the location the house is well kept it has everything you need. It's right on the beach it's quiet very relaxing!! We had a great time. Only one complaint....we had 15 people and did not have enough towels. Had to call to get more and the person I talked to was very, very hesitant about getting us more towels..they brought extra towels but failed to let us know they were at the entrance in a garbage bag!! We found them. House was roomy and comfortable. Location was great. Especially loved the two decks. The house was clean, but not what I would consider well maintained. Fans in one upstairs bedroom and bathroom did not work well. Carpet in master bedroom is badly in need of replacement. Washer and dryer had the build up dirt that accumulates when it is not cleaned. We consider these minor in comparison to the pluses of this beach house. The kitchen was great and well stocked. The beds were comfortable and we throughly enjoyed our stay and would book again. Please, please let us know about things like the fans! Those are super easy fixes but things we might not notice this time of year when the house is full week after week so we consider it a great help when you let us know! When you return you'll appreciate the new carpet in the master and hope you'll show us what you mean about the washer and dryer if they are not as expected. Our family enjoyed the ocean front home, Lagniappe II, very much. The house if clean and well maintained. Lagniappe II is even better than expected, Geoff and staff very nice! Second time we have stayed at this property. Location is excellent as is away from crowds but convenient to restaurants and attractions. Good layout to accommodate ten quests comfortably. Geoff and Susan are very helpful in keeping guests informed about special events and traffic which might impact your stay. This was our families 2nd Thanksgiving staying at this home. We love the location of this home, It is well kept and always very clean. They always text us to see if there's anything we need and if everything is ok. I would recommend this for a relaxing family vacation. By far, the best vacation home we've ever rented. The pictures are exactly what the house looks like. Very much of a kid-friendly home and beach. Can't wait to come back next summer! Our second trip to Lagniappe II was another success. The Lagniappe II has already become a second home to our family. It's exactly what we need. We rented this house for 12 of us and it was perfect! 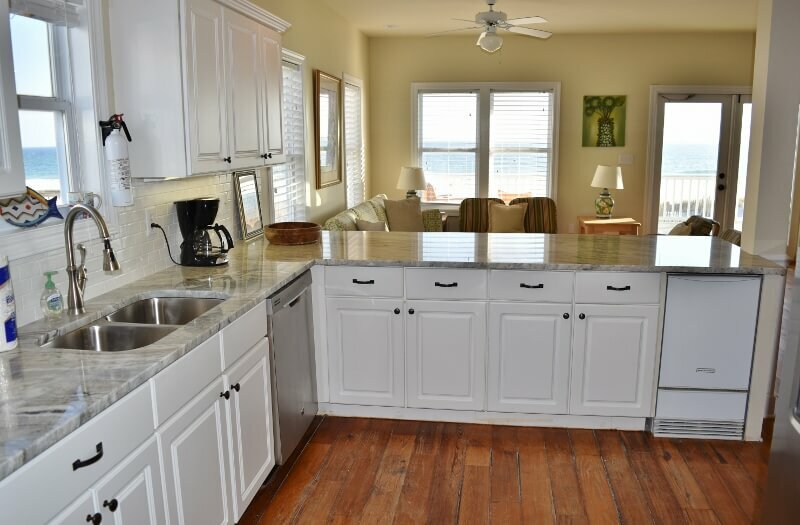 It was extremely clean, right on the beach, the kitchen had what we needed, and we LOVED the extra ice machine. There were not enough towels in the bathroom but as soon as I emailed them, they brought them out that day! I can not say enough good things about this house. If we take a large family vacation to Gulf Shores again, we will definitely rent this house! This was a good house, right on the beach. Property Management checked in to makes sure all was well. There were 10 of us and we had ample room. Kitchen very well stocked. Disappointed that master bedroom wasn't gulf side and the sheets on master bed need updated, they were a bit rough. There is a lot of living room furniture for spreading out, but the chairs are not very comfy. There are ample beach chairs, which is a nice perk. Outside shower has hot water which was great as well. Table on deck needs table height chairs added for eating outside. We used beach service for a canopy and that was a great decision. Fish River Grill #2 in Foley was excellent. This house was very nice! There was plenty of room and well a well equipped kitchen. Great location and very responsive owners. We will be back. The perfect place for our entire family to vacation together. this was the first time our family had rented a house we'd always done condos before but after this experience will probably do a house from now on. we didn't have to worry about the kids being loud and disturbing the neighbors or anything it was just such a relaxing time and had all that we needed we had a grill we could grill out and watch the kids play in the sand it was just so relaxing.best experience ever!! A great week with the family in this beautiful home on the beach. We enjoyed a weeks vacation with the family in this beautiful, spacious home on the beach. The property description was accurate regarding the location of the house. It was very close to all the attractions, grocery stores, and any shopping you needed to do. It was clean, very well maintained and exactly as pictured in the photos. We would certainly recommend the house to any of our friends or anyone wanting a perfect place to spend a vacation with friends or the entire family. We had no problems that had to be addressed during our stay. Everything went very smoothly and we were very happy with our choice of homes. Great House for Big Extended Family! This house was perfect for our group! The living room, kitchen, and dining area are all connected and with plenty of seating that we could all(14 people) hang out and visit comfortably. The house was supplied with plenty of towels and any kitchen item you may need. We loved the decks, what an amazing view! Can't say enough what a great house this was and we would definitely stay here again!! Thank you for having a wonderful place. Our family (from Oklahoma, Kentucky, Florida, New Jersey and Wisconsin) thoroughly enjoyed ourselves. The house was way beyond anything expected. A short walk to the beach. The kitchen was more than adequately stocked, so don't bring any extra utensils. I would bring a charcoal grill liner, this can be purchased at Publix in Gulf Shores. We also brought along a canopy for the beach. Make sure you stay up to watch the moon in the evening as it is spectacular. We had 8, 40+ year olds in the house for a golf trip. We could not have asked for better accommodations. House fit all of us easily, was super clean and very well taken care of. If we go back to the Gulf Shores this house would be our 1st choice!!!! We thoroughly enjoyed our stay in Lagniappe II. We had a total of 10 adults and were very comfortable. The home had plenty of space and could have accomodated a few more. The property was clean and everything was in good working order. Location was good as well - far enough from the crowds but an easy drive to get to restaurants and other entertainment. It was also an easy walk to the inlet to the Lagoon, a popular fishing spot. September in Gulf Shores couldn't be better. The weather was perfect, the water was warm and the beaches and restaurants were uncrowded. Communication from the property owner was timely and informative throughout the process. They even have a smartphone app that provides all the info you need - very nice touch. I highly recommend GSVR and Lagniappe II for your vacation. Our family decided to spend Thanksgiving at Gulf Shores just to relax. This place was perfect right on the beach and easy to to walk to places to shop and eat.The homes has everything you need to just lay back and relax!! Home is beautifully furnished and the kitchen is well stocked. The property is conveniently located and easily accessed. Home was clean and comfortable. Pictures and descriptions were accurate. Rental agency was very informative and responded quickly to any inquiry. Family Reunion on the beach! We had our first ever family getaway and we chose Lagniappe II as our place to stay. We couldn't have been more satisfied. It is a fabulous beach house with access to the beach just a few steps away. Amenities to the house were many and the pictures don't do it justice. Location was perfect as it was just a few minutes of a drive to the "hub" of Gulf Shores. The guests in the houses around us were just as awesome too. All 16 of us had a great time and can't wait to come back to Lagniappe II again! The house was very nice. The rental company was very helpful and answered all questions promptly. This was our second time to stay here with our family. We had our children and their families and my 87 year old mother and everyone enjoyed it. The picnic and swing area is a wonderful place for young children to play. Had a super get away to the beach at Lagnaippe ll! So comfortable and a great layout for extended families with a master downstairs and everybody else upstairs. The antique heart pine floors were gorgeous! Love, love, love the bench swings for spending time with the little ones. Super stocked kitchen with greatly appreciated spice rack. Such a beautiful beach and it is RIGHT THERE at your backdoor. Wonderful views from the balconies and great furniture there for lounging eating etc.1st time we've been to Gulf Shores as we were attending the Hot Air Balloon Festival in Foley for the first time. It was very accessible to Foley but we found it to be a great destination in itself. There were many wonderful restaurants to choose from, good shopping and convenient grocery stores. And the beach is beautiful. Everybody agrees "Let's make this our "go to place" from now on! " Also want to mention the fabulous closet filled with board games, puzzles, kite, and other various beach toys available. I'm sure these vary from visit to visit as things wear out or are added to by families leaving but it added to the friendly feel of the home. The home is not "pristine and formal" thank goodness as neither are we. It is just a perfect spot for spending time with family and friends. 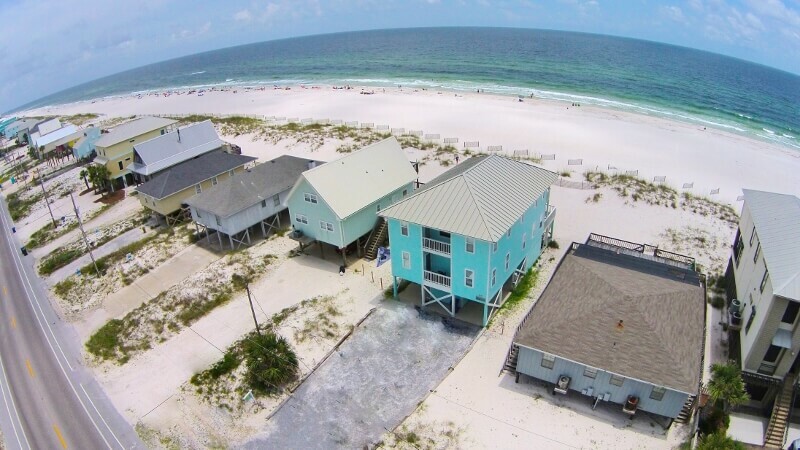 Best beach house in gulf shores!!! I traveled to Gulf Shores with 14 girls for my best friend's bachelorette party. It was the perfect house!! Plenty of space, lots of seating room and VERY comfortable beds. The porch was big and great and plenty of room for parking. Geoff was awesome and very helpful! Price and location were just right and the beach wasn't too crowded. (We visited the second week of March, so the beach may be more crowded during peak summer.) Also, the house had a lot more in terms of essentials than most rental houses. Lots of spices and pans for cooking, good wine, champagne and martini glasses and plenty of plates! This is a great place to stay. I would definitely recommend to a friend. We chose Gulf Shores as a midway point for all the kids whom came from all across the US for my 75 birthday. .First look at the house when we arrived was like coming home , so inviting and had everything we needed. With the house setting right on the ocean all had a chance to experience salt water swimming. We were lucky enough that it did not rain so using the outdoor grill was a treat for March. Seemed like in the evenings the sky was a deeper blue and every star sparkled , the moon seemed bigger sitting on the upper deck or the lower deck swings. Every kind of entertainment and shopping is just under 5 miles. Memories will be a life time because we chose to stay here thanks. Home was beautiful..well stocked with anything you might need. Geoff kept in touch throughout stay to make sure we had everything. Beach view perfect. Full moon over water while sitting on deck fabulous! Close to shopping/restaurants, but away from crowds. Plenty of room for everyone. Loved extra ice maker in kitchen. Deck chairs galore. Warm/cold water shower outside great! We are already planning our next trip to this outstanding home!! A+++++ thanks for everything, Geoff!!!! We had a great time!!! The house accommodated 3 families easily. We cooked every night and found the kitchen stocked with everything we needed to make a variety of meals. The staff was helpful when we couldn't figure out the internet password and they even sent my son's library book back to us when we left it there! Even in cooler weather there were lots of games & puzzles. Loved the deck! We spent hours there! Our Lady of the Gulf was also perfect for Easter mass. Thanks a bunch. We had a great time. Great Stay in Lagniappe II! We really enjoyed our stay here-a perfect place for all 3 generations of our family! The house has a great layout and we appreciated the helpful extras like coffee filters, soap, dish soap, paper towels and plenty of trash can liners that were provided. A nice surprise to find spices in the pantry closet as well. Really liked the under the house parking and inside stairway, as well as the 2 swings, beach chairs and grill. We definitely will come back to this house! Wonderful vacation. Good time had by all. Definitely planning on returning next year. There are blinds on all windows, but not black out shades. The check in process was simple and convenient. Everything was in order in the house and the location was perfect. We loved the decks on every level! The house was well furnished including the kitchen. Our coffee pot didn't work but within hours, a new one had been delivered. Our family loved the house and enjoyed the beach. What a perfect place to celebrate graduation with our family. A wheelchair ramp would have made it more accessible for the grandparents, but we made it work for them. A great stay for Golf Group of up to 8. Facilities were excellent and in easy driving distance for several courses. Minor issues like door opening to beach sticks, probably because of moisture, and charcoal grill should be replaced. All in all, a great time. Everyone loved the everything about it. The house was great, beach great, location great. Loved EVERYTHING about this place! Fantastic location, great layout and right on the BEACH! Our stay at Lagnaippe II was wonderful! The house was just right for us and it was very comfortable. Not a better location. Loved the swings on the ground level. The day it rained, we could still go out to the swings or top balcony. Everything we needed was in the kitchen to cook with. Thanks again so much. Our party of ten (ages 2 to 59 years) enjoyed the week of Christmas 2014 at Lagniappe II. On the one rainy day during our stay there was still plenty to do as the home was near enough to shopping and antique stores to keep us busy. Three generations of our family found the home to be inviting, roomy, clean, and fully stocked with everything we needed to prepare and enjoy Christmas dinner. We also looked forward to our daily walks on the beach, grilling seafood outdoors, checking out local restaurants, and watching dolphins swim along the shore as we enjoyed breakfast al fresco on the roomy deck. We really loved the outdoor space. We would definitely return and could recommend the property without reservations to friends and family. 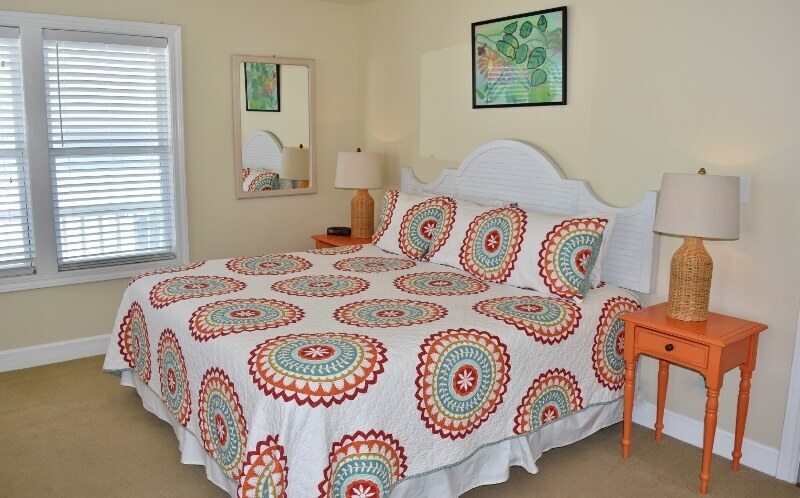 The property managers were responsive and easy to work with prior to our arrival and we had no issues during our stay. and family friendly. And an array of stores and shops are within 5 to 10 minutes' drive. This is a lovely, well-managed beach front property. Hassle-free! We had a great time here. Perfect for what we needed. Several families staying together but still had privacy. Would go back in a minute!!! We travelled to Gulf Shores the last week of March with three other families for a baseball tournament. Lagniappe lived up to all of our expectations and beyond! Everyone had plenty of space and the property was very well maintained and high quality. We all especially loved being right on the beach, yet we were close to everything! I think everyone in our group would return to this property if traveling to Gulf Shores in the future! Also as a side note, the property managers were very responsive to the couple of small minor issues that we had. We had a lovely stay. This house was perfect for our families. It was clean and spacious and well stocked. This was our first time to Gulf Shores and while there were a lot of college spring breakers, our part of the beach was fairly unaffected by them which was nice since we have younger children. We would stay here again!